We are in the fourth quarter of 2017 and deal data is now available through the end of the third quarter. In this report, we review our region’s most active industry sectors and give an outlook for 2017. Rising geopolitical tensions continue to influence deal activity as the industry consolidates and invests in new technology and defense capabilities. United Technologies announced its plan to acquire Rockwell Collins; Northrop Grumman announced its intention to acquire Orbital ATK, representing two of the largest industry deals in the last decade. These two historic deals announced this quarter explain the large gain in deal values quarter over quarter. A response to increasing geopolitical tensions accounts for the value difference between 2017 and 2016. Aircraft and Parts followed by Arms and Vehicles accounted for the majority of total deal value. Electronic Equipment had only a small part of deal value, but most of the aggregate deal volume. analysts expect to see an increase in demand for chemical products and M&A activity as a means for improving profitability. Specialty Chemicals continue to dominate transaction activity with 67% of deal value and 50% of deal volume this quarter. This concentration is expected to remain with demand from a stronger construction sector in North America. 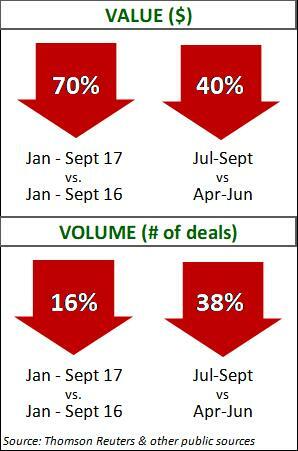 Due to a reduction in megadeals, deal value dropped this quarter. Average deal size was 48% less than the quarterly average. 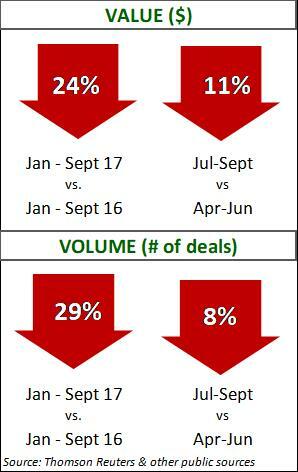 Values are also down from a year ago, showing movement towards smaller middle market transactions. M&A activity was mostly subdued compared to the second quarter, as the industry is weighed down with regulatory and geopolitical issues. Lower total deal volume resulted from the Construction Materials Manufacturing category experiencing rising material cost and delayed infrastructure spending. The Construction Materials Manufacturing category contributed the majority of total deal value, steadily increasing over the last three quarters. 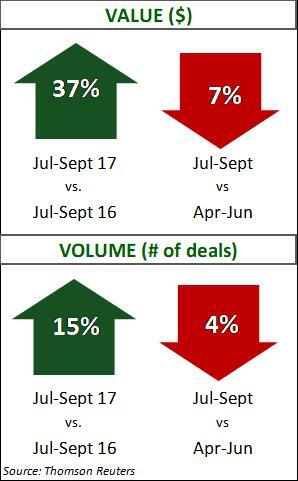 Even with lower volume, the impact in deal value indicates larger transactions in this subsector. Increased demand for infrastructure repairs will continue to drive activity in the US. Any decisions by Washington regarding tax reform or infrastructure spending will most likely impact 2018 rather than the end of 2017. The outlook in the oil and gas industry is as strong as any quarter in recent memory, but the industry continues to see a downward slide in megadeals, suggesting a strategic movement from transformational deals to portfolio realignment. Shale deals moved to the Anadarko, Bakken and Eagle Ford Basins and away from the Permian. Analysts see this not as a negative for the Permian, but rather a reflection of success, as deal-making pushed prices higher in the Basin. 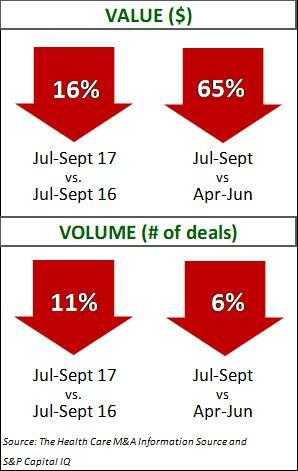 Although mid-stream deal volume was down, this segment had four of the industry’s seven megadeals this quarter. 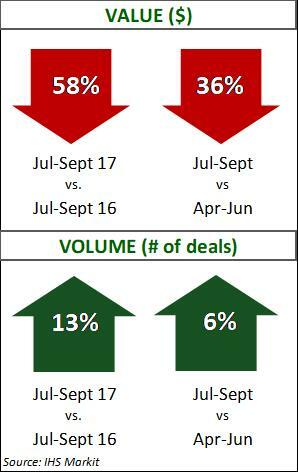 Despite an active hurricane season in the Gulf, downstream deals had a strong quarter with 100% more deals than last quarter and a year-over-year 285% increase in value. Despite continued uncertainty with healthcare reform on the Hill, deal volume remains above 200 transactions for the twelfth consecutive quarter. Due to the significant number and value of megadeals in the second quarter, third quarter values resulted in a large decline. 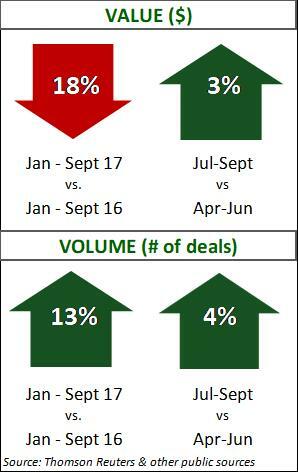 Long-Term Care continues as the most active category with 34% of deal volume, while the Other Services category comes in second with 20% of volume. The Other Services category led value growth with 45% of transaction value due to four out of six megadeals this quarter, the largest being the combination of American Medical Response with Air Medical Group. Managed Care accounted for 24% of total transaction value. The sector remains relatively flat in both value and volume. Industrial Machinery makes up the majority of deal activity, with 44% of all deals. Electronic and Electrical Equipment accounts for second place in both value and volume. Four megadeals comprised 46.5% of deal value this quarter. Third quarter average deal value was 21% lower than 2017 YTD quarterly average deal value, highlighting an increase in smaller transactions. Without a meaningful catalyst such as tax reform, analysts foresee the sector closing the year in a similar fashion to the first three quarters. The Transportation sector continues to have a strong year despite a slight softening in activity from the last quarter. 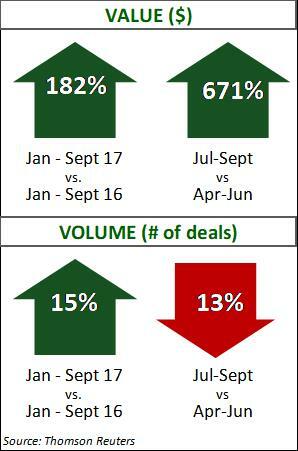 Year to date, average quarterly deal volume is nearly 20% higher than the averages of 2015 and 2016. Logistics led sector growth in deal value, while both Logistics and Passenger Air had record quarter over quarter growth in value. Trucking and Passenger Air had the highest growth for quarter over quarter deal volume. Logistics, Passenger Air and Passenger Ground have surpassed last year’s investment pace. The ten largest deals this year were spread across six sub sectors, indicating a broad range of opportunity. There were six megadeals this quarter, accounting for approximately 60% of total disclosed deal value. Financial investors were involved in four of them, outpacing strategic investors in aggregate deal value.